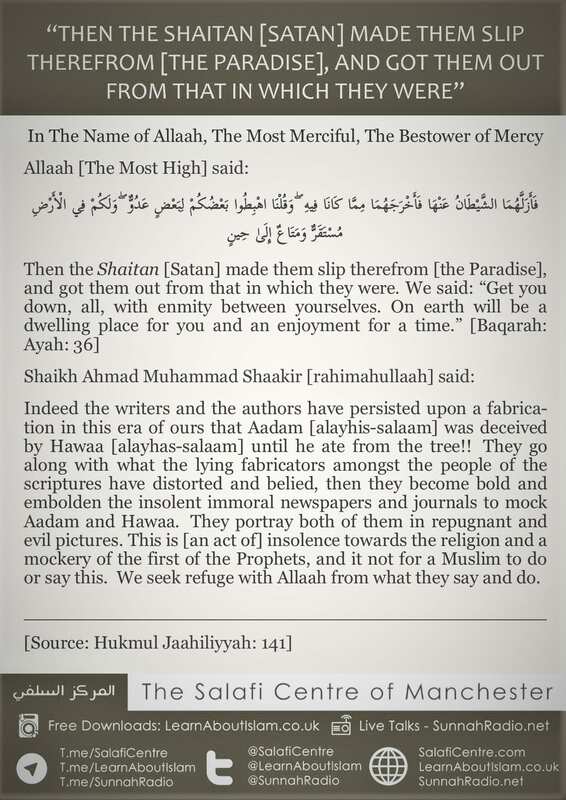 Indeed the writers and the authors have persisted upon a fabrication in this era of ours that Aadam [alayhis-salaam] was deceived by Hawaa [alayhas-salaam] until he ate from the tree!! They go along with what the lying fabricators amongst the people of the scriptures have distorted and belied, then they become bold and embolden the insolent immoral newspapers and journals to mock Aadam and Hawaa. They portray both of them in repugnant and evil pictures. This is [an act of] insolence towards the religion and a mockery of the first of the Prophets, and it not for a Muslim to do or say this. We seek refuge with Allaah from what they say and do.